When kids get into the kitchen and cook, they get more familiar with the ingredients and methods used, and are more likely to try tasting new dishes too. Since kids are also more creative than adults, you might also be pleasantly surprised by their innovations! This section shows you recipes kids can make. Most parents are worried about their kids getting burn or cutting themselves. While you assist them in chopping vegetables, there are many recipes that require no cooking. Right from appetizer and salads to dessert, you can conjure up a whole meal without any cooking. To start breakfast, they can make a healthy drink Beet Treat and Creamy Alfalfa Sprouts and Apple On Toast . Make a toast is very simple, you just have to put the bread in the toaster and wait for it to pop. They can even spread some butter, jam, peanut butter or something like mayonnaise or cheese spread on the toasted bread and pair it up with filling smoothies like the Papaya Melon Smoothie and Banana Oats Smoothie. Kids love desserts and you could make No Bake Oreo Cheescake or something like the healthy peanut butter and muesli cookies. These are recipes kids can make without an oven or stove. Give kids cooked rice and some chopped vegetables to make an easy Chinese Veg Fried Rice which requires little cooking on a non-stick pan. Also, they can make Tava Rice in a microwave. Ensure they are wearing gloves while removing the hot bowl. They can also help you assemble a sandwich, wrap or roll. In case of the Carrot and Beetroot Hot Dog Rolls and Paneer and Capsicum Hot Dog Roll you can make the stuffing and slit the buns and ask them to help you stuff them. This will not only keep them engaged but also, provide you with a helping hand. Delectable treats like Cheese Garlic Buns and Cheesy Wafers require just little baking to melt the cheese. And who doesn’t love cheese?! Make these at home and we are sure kids will clear the plates in a very short span of time. Salads are another great option where kids can lend a helping hand. We are sure they will be excited to try out the simple but fun recipes like Chana chaat. You can even cook the macaroni for the kids to help them make a quick Macaroni and Vegetable Salad. Other Kids recipes you will like Cornflake cookies, Chat Pati Frankies, Jam Tarts, Sweet Corn Soup. 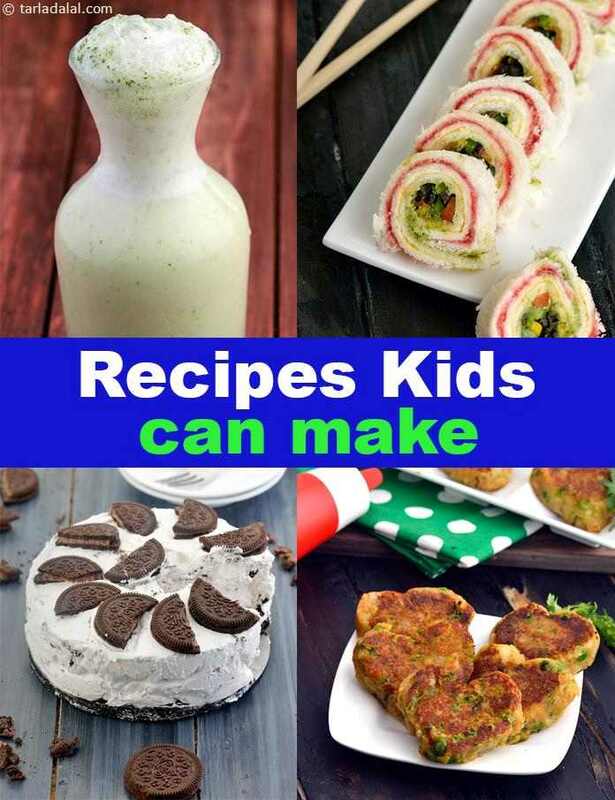 Other Kids recipes you will like. Can you resist the temptation to dip your lips into this tasty milkshake made with fresh and juicy strawberries and bananas? i surely can’t! i am off to make some for myself! the strawberry banana milkshake is also easy and quick to make. The soft flavour and creamy texture of sweet corn soup is always very soothing. You can make this all-time favourite soup easily with canned cream-style corn. Take care to add pepper according to your taste. Served with a cup of sauce, fried rice is a wholesome one-dish meal that is liked by children as much as elders. Once you have cooked rice and chopped veggies ready, it is also very easy to make. Just take care to sauté the vegetables swiftly on a high flame to retain their colour and crispness. When you feel like having dahi vada, but there are no vadas at home, here is an easy and tasty workaround. You would never have thought of making quick dahi vada with butter biscuits, fresh curds and a mild sprinkling of spices. Try it, and you will love it.